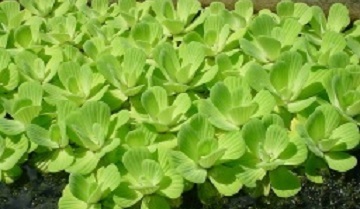 Water Lettuce has thick, soft leaves that overlap each other. Water Lettuce is a floating plant with leaves above the surface of the water and roots hanging below to collect nutrients. The leaves are thick and soft and form a shape similar to a rose. The softness comes from the tiny hairs that cover the plant and help it float. The flowers of the plant are in the center of all the leaves, and occasionally will produce small green berries. These plants form very thick colonies, and if left untreated, can deplete oxygen in the water which causes fish kills. Found in gulf coast states and in the calmer waters in Florida. Water Lettuce produces new buds from the ends of stolons connected to the bottom of the plant. Dibrox® herbicide will treat water lettuce. These products can be purchased on our website.